Recently on a brisk, sunny Saturday morning I left Athens for Wetzel County West Virginia. I was with a group of local folks who like me were concerned and curious about hydraulic fracturing of deep shale rock to extract natural gas, the process that has commonly come to be known as fracking. 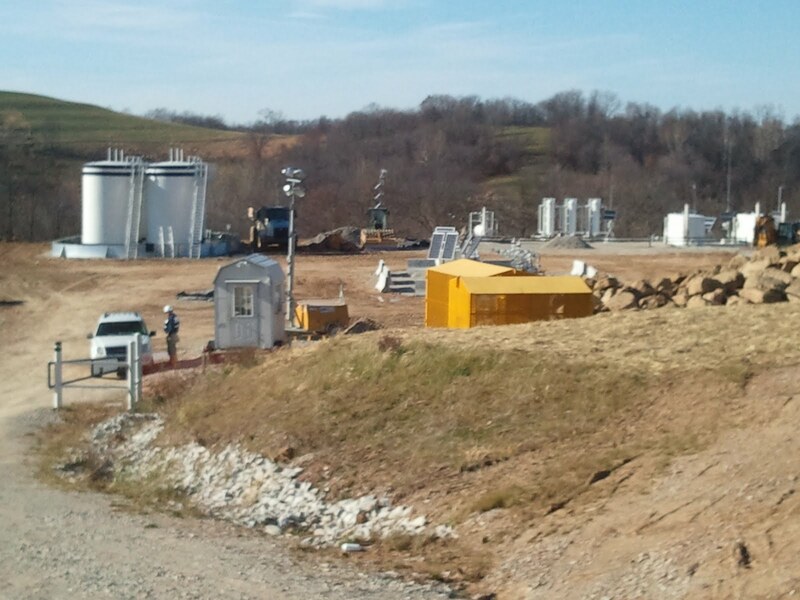 Over the course of the last several years Wetzel County has become a focal point of fracking in West Virginia with the promise of jobs and prosperity. Admittedly I did not know what to expect in making this trip. Like many people I have heard and seen the stories of exploding kitchens sinks and tainted water wells depicted in documentary films like Gasland. And like anyone who watches television I have seen endless natural gas industry advertisements touting jobs and cheap energy as some of the benefits of fracking. With conflicting views and an open mind I travelled up Highway 7. From Martinsville we drove up the winding road dotted with modest homes, pickup trucks and vegetable gardens. Stopping in the small hamlet of Wileyville we met our guides for the trip up to the fracking fields. Heading out further up the mountain it was not long before we stopped on a narrow, not quite two lane road of freshly laid asphalt when suddenly we were forced to stop. A flagger was stopping uphill traffic as no less than half a dozen dump trucks navigated around a sharp curve. With bare inches of road and gravel shoulder to spare the trucks edged passed us narrowly avoiding a steep drop off hundreds of feet to the canyon below. I learned later that the truck traffic is a nearly round-the-clock hazard which residents encounter. Hillside slips are common and the trucks beat the pavement down which explains why the road has been repaved multiple times over the last two years. The residents I spoke to told stories of delays and impassable roads often requiring miles-long detours down the backside of the hill. For people unlucky enough to live adjacent to the roadbed their daily lives are now a cacophony of noise, dust and vehicle wrecks. A few more switchbacks up the ridge and we arrived at the home of county resident Dewey. Dewey is a simple man, an Army veteran who served in Vietnam, came home and worked in the Laborer’s Union for 35 years. In 2008 he and his wife purchased a 100 or so acres on a ridge top with a simple dream to live out their days in a modest singlewide mobile home, grow a subsistence garden and graze his granddaughter’s pony. 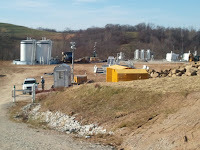 When the drilling started Dewey, like other surface land owners in Wetzel County, discovered that he had virtually no recourse, nowhere to turn and no rights to compensation other than what Chesapeake felt compelled to give him, a one-time payment of $18,000. One quarter mile from his home the hilltop was leveled by more than 19 feet, the trees, dirt and his garden bulldozed into the valley. A holding pond built to contain fracking chemicals, water and drill tailings was drained – only halfway. The remaining material was mixed with dirt and spread over the pad. The fracking pad takes up more than 4 acres of land with two wells and permits for 4 additional wells which can be drilled within 200 feet of Dewey’s front door. The promulgation of West Virginia’s 200 foot rule was simple. The maximum height of the drilling rig is 175 feet and if toppled would miss the house by 25 feet. His land value has dropped from $1,700 an acre to $700 and Dewey is responsible for paying taxes on land he no longer can use. Shortly after the hydraulic fracturing began the pony stopped drinking the well water. Dewey discovered his well was tainted. The well had been rendered unusable forcing Dewey to haul 1000 gallons of water a week for bathing and cooking and buy drinking water from Kroger. As for the pony she drinks the hauled water without complaint. Moving on we stopped at the Martin place, travelling to the top of a steep hill. The view was spectacular except for the many fracking pads and a drill site in the distance. Looking east I saw a large compressor station installation about a mile away. Recently complete the six giant compressors move gas coming off the wellheads through pipelines to larger pipelines that now honeycomb the countryside. Before we left I asked the owner what the compressors sounded like when not shut down for repair. “Like a tractor trailer idling outside the window, 24 hours a day” she said. We would later visit a larger 12 compressor station running full blast. Mrs. Martin was right. These stories are typical of many echoing across this once idyllic countryside. In Wetzel the promise of jobs was never fulfilled and suffers the highest unemployment rate in West Virginia. It turns out the drilling crews, pipeline crews and crews that flatten the hilltops are largely from out-of-state and drilling outfits are said to be scouting a site for a “man camp” capable of accommodating 400 to 700 workers. Is this the future of Athens County? Back home in Shade that evening I reflected on what I had seen and heard, arriving at a simple conclusion – Ohio must immediately enact a moratorium on fracking until we know exactly what the impacts on people and the environment will be. It would irresponsible and immoral to have the people of Athens County and Southeast Ohio left holding the bag for lack of a comprehensive plan. We need to ensure the rights of people and mandate strict protections of our air, water, jobs and infrastructure before the drilling starts and not wait until the damage is irrevocably done. Mike O’Brien is an Athens County resident and Democratic candidate for county commissioner.